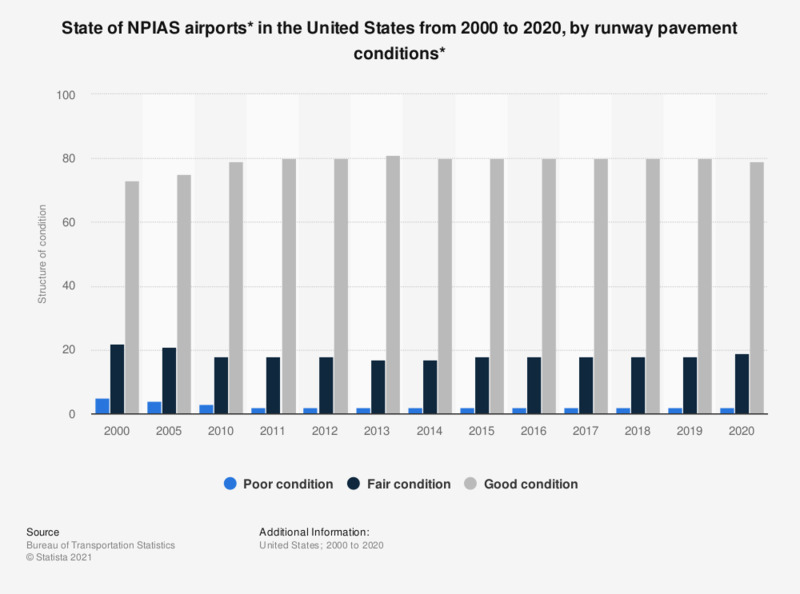 This statistic illustrates the state of U.S. airports from 2000 to 2017, based on the runway pavement conditions. In this time period, U.S. airports' runways have been slightly improving. In 2017, some 80 percent of airports runway pavements were in good condition. A list of U.S. airports can be found here. * The U.S. Department of Transportation, Federal Aviation Administration's (FAA's) National Plan of Integrated Airport Systems is composed of all commercial service airports, all reliever airports, and selected general aviation airports. It does not include over 1,000 publicly owned public-use landing areas, privately owned public-use airports, and other civil landing areas not open to the general public. NPIAS airports account for almost all enplanements. In 2005, there were approximately 16,500 non-NPIAS airports.